This fast-moving tale was one of the most entertaining stories I've read in a long time. Not only did I find numerous scenes laugh-out-loud hilarious, but it had enough suspense for me to stay up into the wee hours of the night to see how it ended. Ironically, one of the reasons I bought this book was because one of its reviewers gave it a poor rating simply because it was politically incorrect. And they were right, it certainly is. And therein was where I found most of the humor. The snarky, cynical comments were such an accurate reflection of the state of the world today that you either laugh or cry. I, for one, prefer to laugh. The story begins with the Roswell incident back in 1947, with which any UFO nut like myself is duly familiar. The author did an excellent job of recounting the incident and blending those individuals mentioned in the historical record with fictitious characters. In fact, it's difficult to tell where the truth (which is undoubtedly out there) ends and speculation begins, placing this story within that popular sci-fi subgenre where fact mingles comfortably with supposition. This version of the incident begins when a counter-intelligence officer recovers an ereader the surviving alien was trying to destroy. They discover that it activates when picked up and displays alien writing on its screen, but shuts down a few moments later, leaving the person slightly light-headed. The device eventually winds up in the hands of the CIA where Miles Ashly, a linguist, and Lambert Gray, a cryptographer, are tasked with the translation and soon discover that as they begin to recognize certain words that the device "speaks" the word telepathically, providing the pronunciation, then eventually starts teaching Ashly the language. When they uncover the aliens' "Mission Plan" they are horrified to discover that their intent was to exterminate the human race. Once the failure is apparent to those back on Tau Ceti, a new attempt will be made which they expect will occur around 2016. The author marches through time, taking us to the present while tying in various historical events, such as the race to the Moon as well as other presidential administrations. Eventually Ashly retires and decides to teach the alien language to his grand-niece, Carrie Player, telling her it's the language of the Dogon people. Years later, when he's on his death bed and Carrie is an adult, he tells her the truth and advises her to write the CIA a letter about her special skills when she graduates from college. She does and, as expected, they hire her. It takes a couple decades but eventually the dreaded day arrives when three UFOs are discovered on a course toward Earth. Their plan is not to kill everyone overtly, but rather render everyone sterile, so they would die off over time. The reason for this action is because Earthlings are a potentially harmful, belligerant race that poses a potential danger to other civilizations in interstellar space. Eventually contact is made with the incoming craft and Carrie converses on her cell phone with their leader, a grey, almond-eyed alien named Deshler, and the real fun begins, starting with her assigning the theme from The Twilight Zone as his ring tone. Her goal, as expected, is to talk him and his crew out of completing their mission to exterminate the human race. Various remarks about how our government operates as well as conducts international relations definitely were politically incorrect. For example, Carrie's question during one conversation where she asked, "We have many parasites who live off the work of others. Could you use your sterilization stuff selectively? There are plenty of people I would like to stop from reproducing." The POTUS is not shown in a positive light, either, which would undoubtedly be offensive to some if you projected his identity to an actual person. Frankly, depending on your political persuasion, he could be from either major party, both of which are laughable these days, if you maintain your objectivity and sense of humor. Thus, those of you who can see our current state of affairs for the FUBAR it is will appreciate the satire and what is a rather convincing tale with enough credibility to make you wonder, as good fiction should. The dialog is convincing but includes quite a few f-bombs, so those who prefer less graphic language may want to look elsewhere. 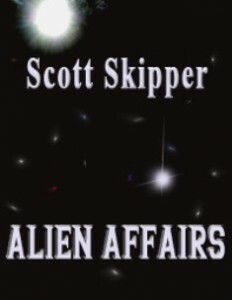 If you're a UFO fan you'll recognize numerous familiar stories and names which provide authenticity and credibility as they interact with Skipper's characters. Depictions of how the various government agencies would react to the situation's developments are believable, the characters diverse and engaging, the technology described sufficient to satisfy hard sci-fi fans. The story would make an excellent mini-series with its outstanding balance of humor, suspense, and UFO lore, somewhat like a cross between The X-Files and Men in Black. I found it sci-fi at its best with any political incorrectness contributing to its authenticity. I'm actually glad that it's the first book in a series and look forward to reading the sequels. Marcha Fox is an avid science fiction fan and author with over 20 years experience working at NASA's Johnson Space Center in Houston, Texas, and the author of the Star Trails Saga.